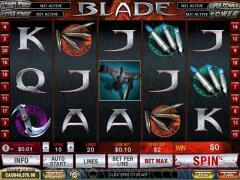 Blade is a video slot developed by Playtech in conjunction with Marvel Movies. It features the vampire hunter super hero Blade. Blade is the wild symbol and Blade Logo is the scatter symbol. There is another special symbol, the Blade Split symbol. The Female Vampire is an important symbol. Other symbols are the weapons used by Blade. These are Firearm, Knife, Darts and Bullets. High value cards from Ace to Ten appear as symbols on the reels. These are crafted as steely objects with sharp blade-like edges. All three betting options can be manipulated in Blade. Players can enable up to 20 paylines and can wager up to 10 coins per payline. Players can choose the coin size from 8 options that range from 0.01 to 0.05. Three or more scattered Blade Logo symbols appearing anywhere on the reels trigger the Free Games feature. 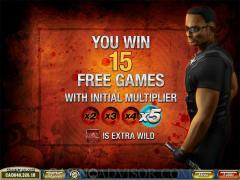 In this feature 15 free games are awarded with variable multipliers. 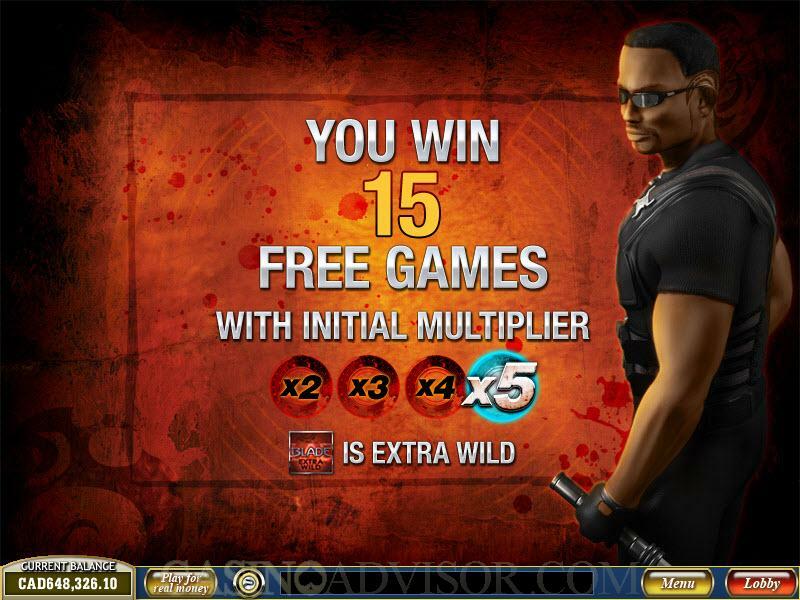 The free games start with an initial randomly chosen multiplier between 2x and 5x. After every winning spin the multiplier increases in steps of 1. The multiplier cannot increase beyond 5x. After every non-winning spin the multiplier decreases in steps of 1. The multiplier cannot decrease below 2x. 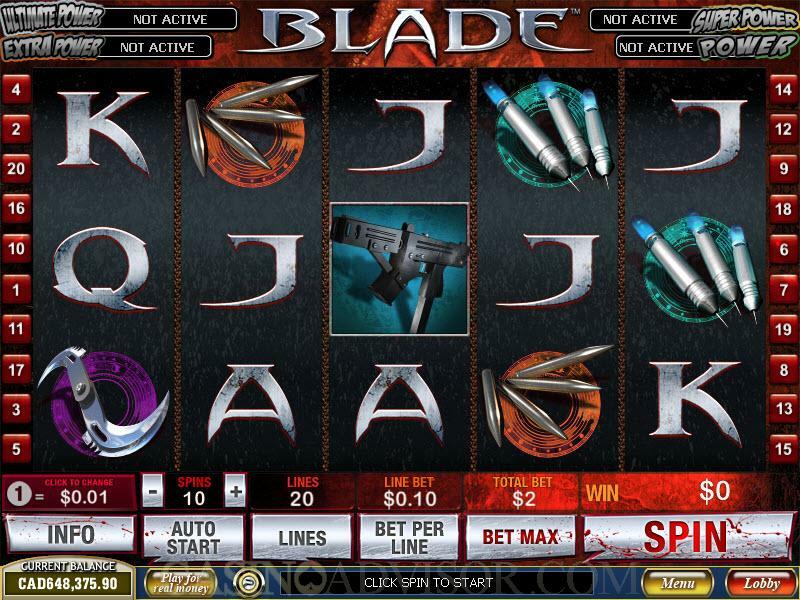 The scatter Blade Logo symbol serves as an extra wild during free spins. Free spins can be retriggered infinitely. The Blade Symbol Split feature is activated when the Blade Split symbol appears anywhere on reel 5. Then the last symbol of every winning combination is split in two and counts as an extra symbol in the payline. For example if a winning combination consists of three symbols. The symbol on the third reel will be split and the combination will payout for four symbols. When the fifth symbol in a combination is split it gives rise to payouts with six symbol combinations and these are huge. Five Blade symbols pay out 2500 coins but six Blade symbols pay out 25,000 coins. Blade is linked to the four level Marvel Mystery progressive jackpot. The four levels are Power, Extra Power, Super Power and Ultimate Power. The jackpot is randomly triggered but has greater chances of being triggered at larger wagers. Once the jackpot is triggered the screen shows a grid of 20 squares that hides the symbols for the various jackpot levels. The players click on the squares to reveal the symbols. When three matching symbols are first revealed the corresponding jackpot is hit. This progressive jackpot is disabled when playing for fun. Interested in reading more detailed information about Blade? If so Click Here for more details.